Yay! My quilt top is done. The last part of the piecing process, squaring up the curves by adding bias cut, strip pieced corners as reviewed in Step 7 is finished. Now it's time to stitch my moody, modern, pieced top into a quilt. A. Make a quilt sandwich out of your top, batting, and something nice for the back. I used two layers of Fairfield's Polyfil Natural Cotton Batting for the filling. If you have no idea what I'm talking about when I say "quilt sandwich", refer to Oh Franson's excellent tutorial on Making The Quilt Sandwich. B. Mark your stitching line without a template. I use chalk to draw my stitching pattern free-hand. Sometimes I only chalk one line of the pattern and then echo it out across the rest of the quilt. Sometimes I stitch in the ditch. Think creatively about how you want your stitching lines to complement and contrast your piecing lines. C. Hand quilt with multi-colored pearl cotton. I use a medium sized embroidery needle with #8 pearl cotton to hand stitch most of my quilts. I'm not much of a machine quilter. I enjoy the meditative process of hand-stitching, and I love the look. Big, hand-stitches with colored thread is a nod to tradition with a modern twist. Since the thread is thicker and my stitches are bigger, hand-quilting takes less time. I recommend Sew Mama Sew's tutorial, Learn How to Hand Quilt, for the basic mechanics. In Step 9 I'll show you how to do an invisible binding. If you are entertaining the idea of making your own mod-mood quilt, I want to hear from you. What strikes your fancy? What’s holding you back? Join the challenge! Share images of your process on the Mod Mood Quilt Flickr pool. Or grab a Mod-Mood Quilt button here to post on your blog and join my blog roll. 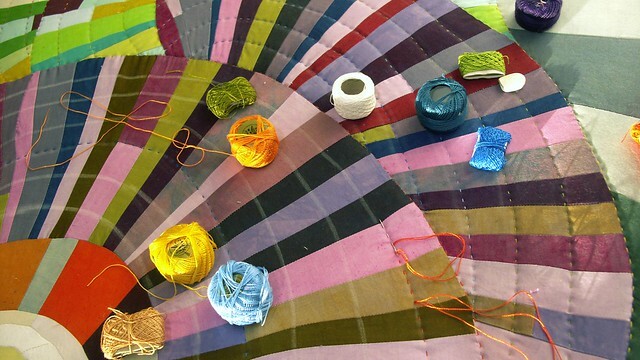 If you are already working on a mood quilt, post an update or any questions you have about the process or techniques and I will respond.